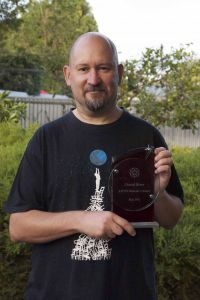 The Director's Award is awarded at the Director's discretion in the form of a plaque to an outstanding observer who contributes to special observing projects or contributes to the work of the AAVSO in other ways. 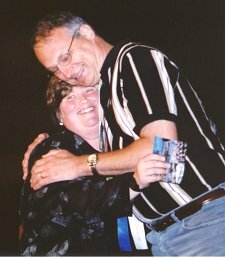 for his excellent leadership and work with the AAVSO Exoplanet program, training observers through the relevant CHOICE course, workshops, and manuals, creating and overseeing the design of the AAVSO exoplanet database, and his continuous involvement in cutting-edge science with HST and TESS. 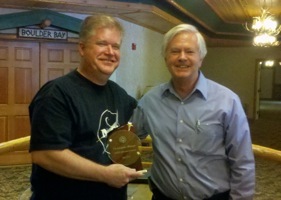 George A. Silvis received the AAVSO Director’s Award in recognition of his hard work at AAVSO Headquarters, major contributions to the AAVSO’s software and database infrastructure (including supporting and enhancing VPhot), and his continuous involvement with various key AAVSO projects (including leading the Eggen card project and the annual Transformation campaign). 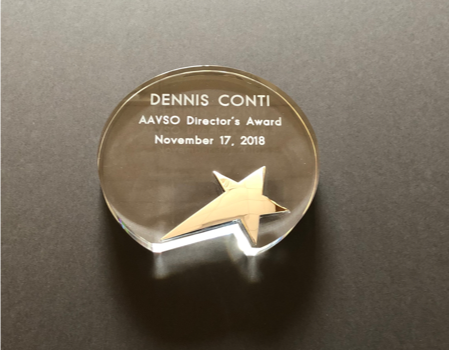 We celebrate his dedication to the AAVSO, we are thankful for his energy, expertise, and enthusiasm, and we present him with the 2017 Director’s award as a token of our gratitude for his commitment and dedication. 2016—No Director's award was given this year. 2015—No Director's award was given this year. 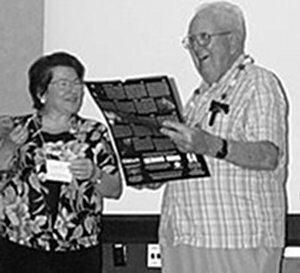 In recognition of his invaluable contributions to the AAVSO through his service as Council member since 2012, major contributor to the data digitization project with over 100,000 keypunched observations, developing the methodology and standards for digitizing publications, CCD observations of legacy LPVs and CVs, AAVSO membership and services surveys, new membership and dues structures, director evaluation procedures, newsletter articles on historical AAVSO observers (and being an all-around good guy). 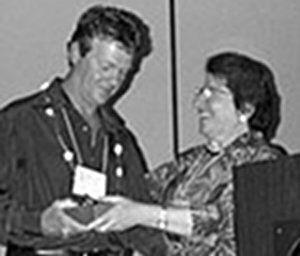 In recognition of his continued support of VPHOT, the AAVSO's key photometric analysis program. Geir has contributed years of software design and effort into making VPHOT the premier photometric package available on the Web. Geir has ported the program to the Cloud; has listened to both staff and members to make suggested improvements; and has been available seemingly 24/7 to correct any problems. He has supported the CHOICE choice on this program. Somewhere in his "spare" time, he has also contributed over 17,000 photometric observations to the International Database! VPHOT is a marvelous tool for members using AAVSOnet or their own telescopes; is quick and easy to learn; and has both written and video manuals and tutorials. Without Geir's programming expertise and insight into how observers might want to analyze their data, VPHOT would not exist today. In recognition of John Gross' continued support of the Sonoita Robotic Observatory, the key telescope in AAVSOnet. John has contributed his time and money to this project, keeping the system running nearly continuously for over 8 years. In addition, John has provided countless hours of volunteer programming time to AAVSOnet, helping many sites through the software integration process, including the two newest telescopes (OC61 and TMO61). He is always there for any question, and has been my mentor for working on Windows computers. 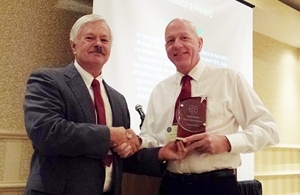 In recognition of Chris Watson's work as an AAVSO Council member and his contribution of countless hours of technical expertise to the creation and refinement of VSX, VSP, and VSD. 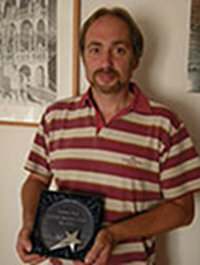 In recognition of David Benn's work in porting Variable Star Astronomy (Hands-on Astrophysics) software into a modern Java tool. VSTAR became the showpiece for the Citizen Sky project. 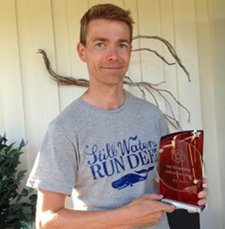 "David is the perfect example of a volunteer who brings to the table expertise not available at headquarters; devotes an enormous amount of time and effort in supporting our organization; and does this without asking for any recognition. This award is only a small token of my appreciation for his contributions." 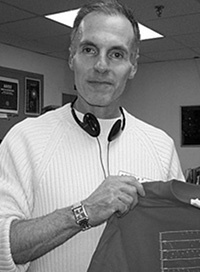 2010—No Director's award was given this year. 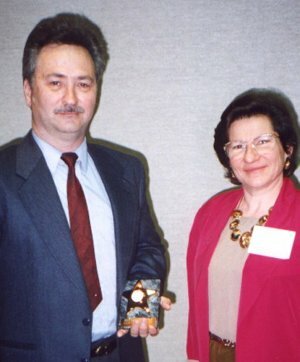 ... in recognition of his unique ability to achieve high precision visual estimates and his mentoring of others to help them reach their visual observing potential, and of his contributions to reviewing submissions to the International Variable Star Index (VSX) and guiding observers through the submission process. 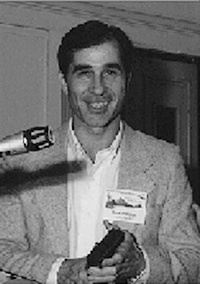 ... in recognition of his contributions to the field of data mining, and of his volunteer effort in support of the International Variable Star Index (VSX), including importing many published lists of stars, reviewing submissions, and acting as a mentor to observers who have discovered new variables. 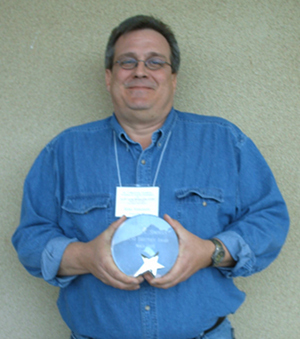 2008—No Director's award was given this year. 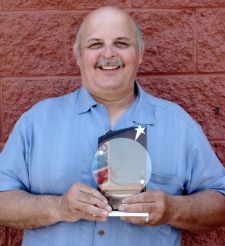 ... for his leadership of the Comparison Star Database Team, devoting numerous hours in the documentation of every comparison star currently used by the AAVSO. 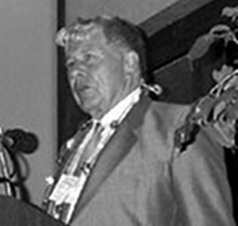 Vance also utilized his database skills in the creation of the Variable Standards Database, a masterful relational database of the comparison stars that can be updated in perpetuity. 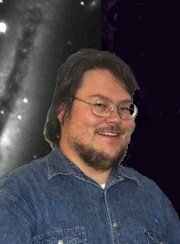 All the while, Vance has been a major observational contributor to our International Database, showing his enthusiasm and pursuit of all aspects of variable star astronomy. 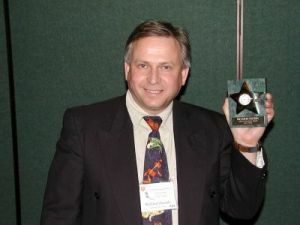 2006—No Director's award was given this year. 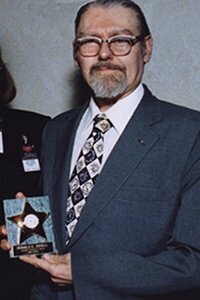 ...for his dedicated contributions since 1973 to special observing programs and the AAVSO International Database, for his inspiring and mentoring of new observers, and his astronomy education efforts, particularly for young people. 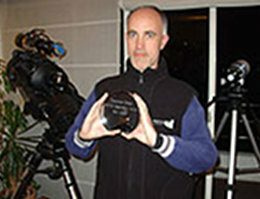 ... for his meticulous CCD high-speed photometry of objects whenever possible, providing vital contributions to special observing programs and the AAVSO International Database, and for his outreach and mentoring of new CCD observers in his native Finland. 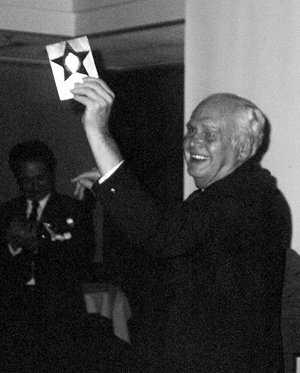 ...for his contribution of timely variable star observations during special observing runs with ground-based and satellite instruments and a cumulative total of nearly 25,000 since 1980, his work in the investigation of comparison and field stars suspected of variability, in helping to improve charts and comparison star sequences, and his fostering of variable star observing through his many dynamic talks to RASC Centres and other astronomy groups this past year. ...for his meticulous observing of variable stars (over 100,000 observations since 1991) and his contribution of timely and often critical observations during special observing runs with ground-based and satellite instruments, making immediate observations at the request of Headquarters to confirm potential discoveries, and, as Director of the Variable Star Section of the British Astronomical Association, mentoring observers, fostering productive collaborations and amity among variable star observing associations worldwide, and working to maintain and improve the level of variable star observing worldwide. 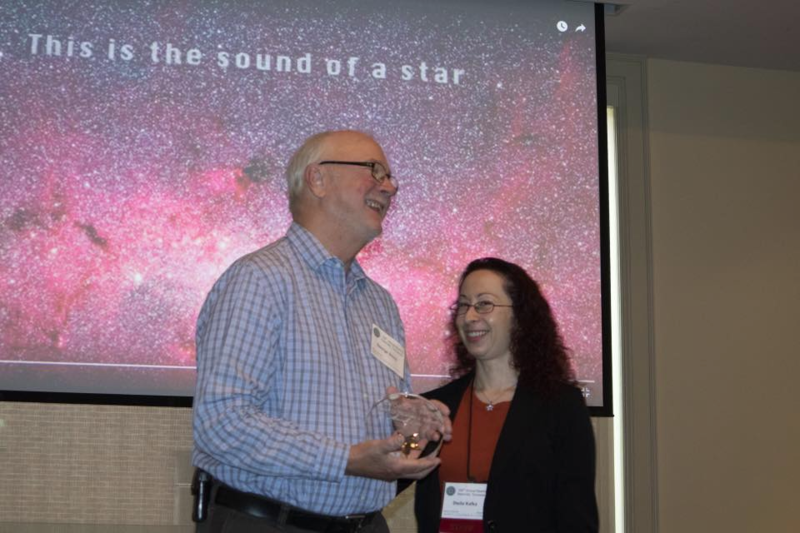 "... for providing valuable and often pivotal data during special observing runs, for his contributions to AAVSO chart work, and for maximizing the value of his observations through very careful planning of his observing program." "...for his tireless efforts in chart making...."